The early Christian Church was a chaos of contending beliefs. Some groups of Christians claimed that there was not one God but two or twelve or thirty. Some believed that the world had not been created by God but by a lesser, ignorant deity. Certain sects maintained that Jesus was human but not divine, while others said he was divine but not human.In Lost Christianities, Bart D. Ehrman offers a fascinating look at these early forms of Christianity and shows how they came to be suppressed, reformed, or forgotten. All of these groups insisted that they upheld the teachings of Jesus and his apostles, and they all possessed writings that bore out their claims, books reputedly produced by Jesus's own followers. Modern archaeological work has recovered a number of key texts, and as Ehrman shows, these spectacular discoveries reveal religious diversity that says much about the ways in which history gets written by the winners. 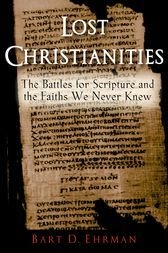 Ehrman's discussion ranges from considerations of various "lost scriptures"--including forged gospels supposedly written by Simon Peter, Jesus's closest disciple, and Judas Thomas, Jesus's alleged twin brother--to the disparate beliefs of such groups as the Jewish-Christian Ebionites, the anti-Jewish Marcionites, and various "Gnostic" sects. Ehrman examines in depth the battles that raged between "proto-orthodox Christians"--those who eventually compiled the canonical books of the New Testament and standardized Christian belief--and the groups they denounced as heretics and ultimately overcame.Scrupulously researched and lucidly written, Lost Christianities is an eye-opening account of politics, power, and the clash of ideas among Christians in the decades before one group came to see its views prevail.